Hi! It’s me again, Eline from Antwerp – Belgium. 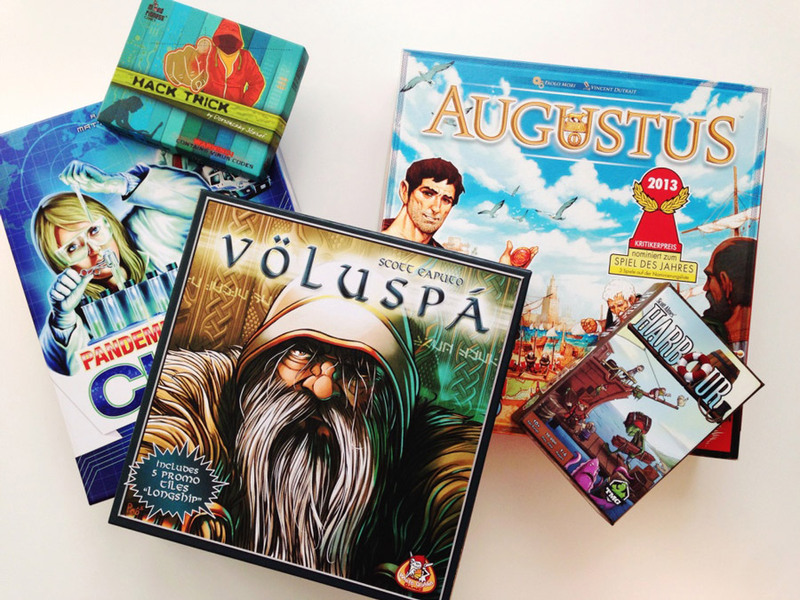 A few weeks ago you could read all about me and my board gaming habits in the 24th edition of the Analog Games series Board game shelves around the world #24. In the introduction, I mentioned my love for travelling. With both me and my boyfriend being board game addicts, it goes without question that for each trip we carefully select games to bring along. When abroad, we are always on the lookout for tabletop cafés and visit the local board game shops. I can never keep myself from buying a “souvenir”. In this “I’m going on vacation and I’m bringing…” series, many of my top rated travel games were praised: Hive, Qwixx, Star Realms, 7 Wonders Duel, Jaipur, Codenames, Parade, Tides of Time, … and a few titles drew my attention: Space Hulk, Loot, Happy Pigs, Deep Sea Adventures, The Hare & the Tortoise … I’m excited to give you my selection of board games that I’ll take with me on my next holiday! My focus lies on games that play well with 2, while supporting a higher player count. My boyfriend packs and carries all board games most of the time, as travelling light is not my forte. My suitcase is always full with too many clothes and too many pairs of shoes ☺, woops! This must be one of the games that I own the longest but have played the least. My gaming group mostly prefers something heavier and the oversized box isn’t that attractive. I love meeting new people on holiday and I believe that this is the perfect gateway game that can lure in people not accustomed to modern board gaming. Augustus is actually Bingo, set in ancient Rome and topped with some “take-that” elements and strategic decision making. 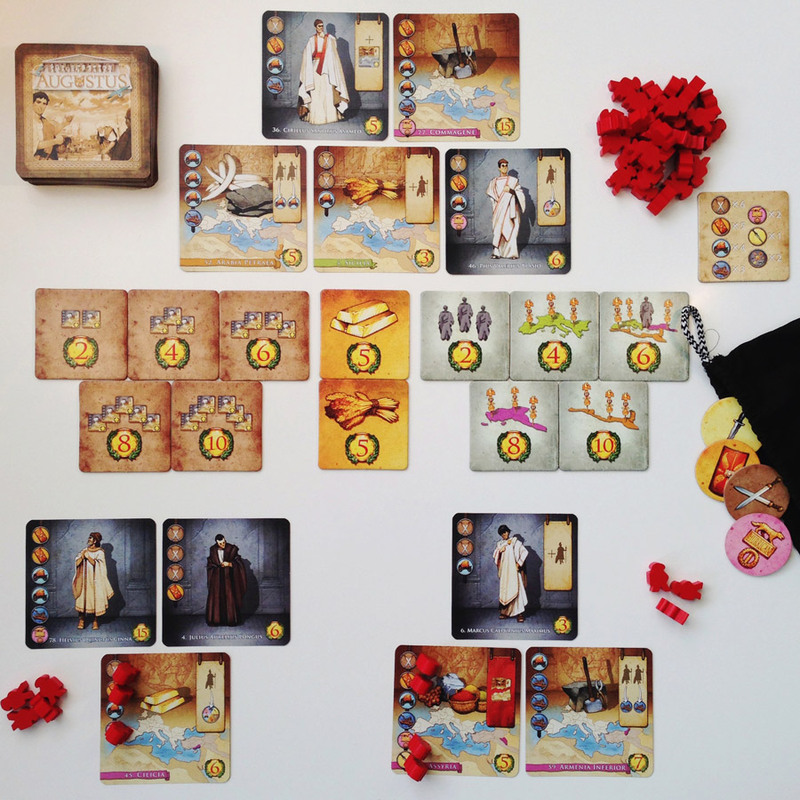 In Augustus 2–6 players are “legati Augusti”- representatives of Augustus. Vying for power, players try to take control of as many provinces and acquaint as many senators hoping to be elected “Consul” at the end of the year. Each player gets dealt 6 objective cards and selects 3. 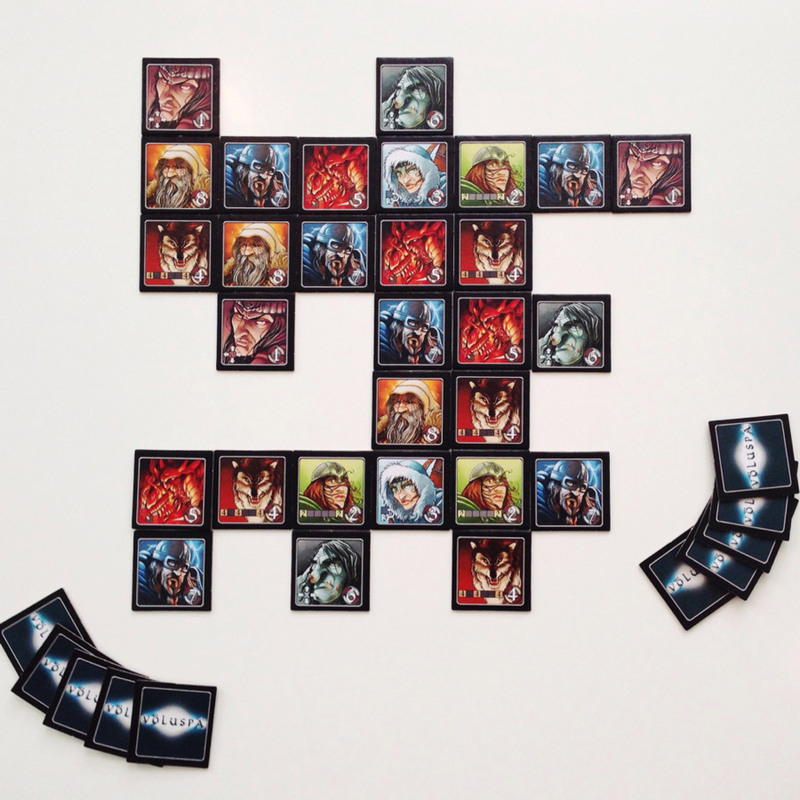 The shuffled deck is placed in the middle with 5 objective cards revealed. Next to these the bonus tiles get displayed. 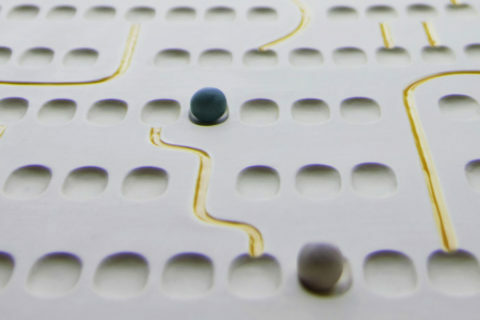 The first player draws and calls tokens from the bag, and every player assigns one of his seven legions to a corresponding symbol on an objective in front of him. When a joker is drawn, players can place a legion freely, all tokens are returned to the bag and the next player starts drawing. When you manage to fulfil an objective card, you shout “Ave Ceasar!” and carry out the card effect. These effects can give you extra actions or points, but often let you boycott another player. These little vicious acts, like clearing all legions from an opponent’s objective card, make the game very enjoyable to me. The game ends as soon as a player completes 7 objectives. The player with the highest score is the winner. Each fulfilled objective gives points, but obtaining bonus tiles is most of the time needed to win. Some bonus tiles are for the first player completing three objectives of the same kind, others for the player that collected the most gold or wheat and some for the number of objectives you completed. The oversized box is really ridiculous; the token bag can hold all game components. It’s a shame that the square cards can’t be sleeved for durability. 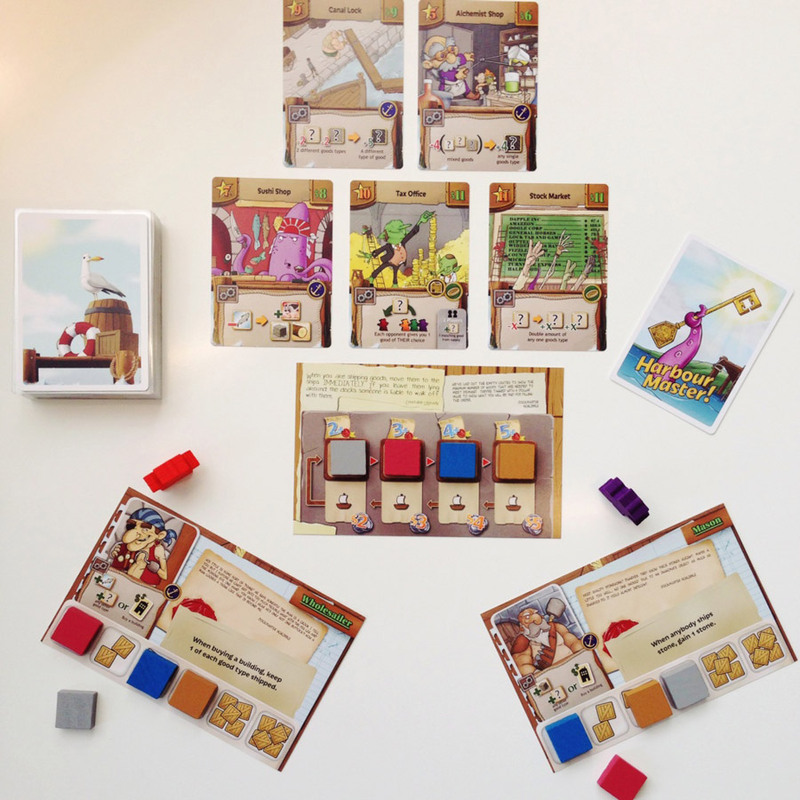 In Harbour 1–4 players are ambitious entrepreneurs in the busy port of Gullsbottom. It’s a worker placement game, in which players carefully need to collect and ship goods and use the income to buy buildings. The game takes about 20 minutes per player and ends when a player constructs his 4th building. After a final round, players count the total value of all their buildings and the one with the highest score gets crowned the “Harbour Master”. For set up the 36 building cards are shuffled and a number equal to the player count +3 gets revealed. Each building is an action space with a unique ability allowing you to gain goods, convert goods, ship goods and buy buildings or to perform a special action. Your personal Player Board shows a starter building and a warehouse where you can keep track which and how many goods you own. The heart of the game is the ever changing Market Board that shows the current value of each type of good. Every time a player purchases a building the market gets adjusted and the value of the goods you struggled to collect can plummet or shoot up. Especially challenging in this game is the fact that when you ship goods to acquire a building, you always lose all goods of the required types. So the risk of making a poor trade deal is big. The action space of a bought building stays available for all players: for the owner the use is free – all other players need to pay the owner one good of their choice. A newly revealed building brings a new available action space in the game; allowing changes of strategy and keeping the gameplay “fresh”. 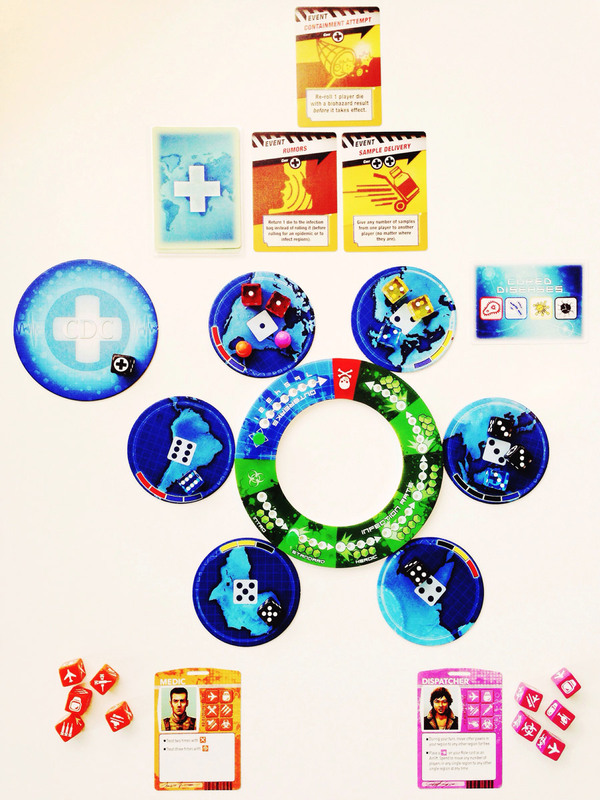 The 14 unique player boards, combined with the randomly drawn buildings create a huge variety in gameplay. I love how TMG managed to strip eurogaming down to its core with Harbour. 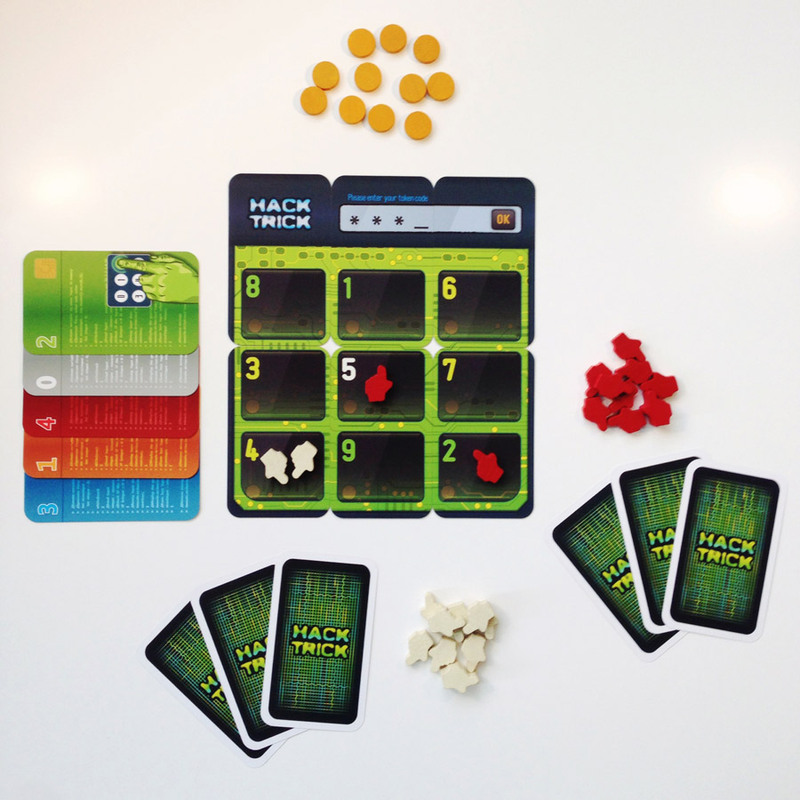 Hack Trick is a game of deduction and card combination. 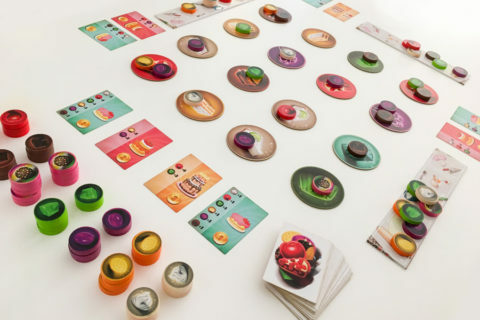 The base game is designed for 2, but additional rules are included when you want to play it with 3 or 4. In Hack Trick players are hackers, vying for the highest rank. The first player who can mark a 3 digit password on the magic keypad earns experience level 10 and will gain the highest respect and reputation in the hacker community. Six cards form the magic keypad. There are 18 data cards in the game, with a value between 0 and 5 – 3 of each. This data deck is shuffled and 2 random cards get removed. The starting player receives 4 data cards, the dealer 3. The starting player then places one card of his choice next to the keypad starting a sequence. Each time a player adds a card to the sequence, he marks the key indicated by the sum of the last 2 numbers. The players who manages first to mark a row, a column, a diagonal or 3 times the same key is the winner and receives an excellence point. The 1st player with 5EP’s is the winner. Players can capture another’s markers by marking a key occupied by the other player. With these captured markers you can force your opponent to tell you the sum of his hand. By sacrificing one of your own markers you can control the next player’s turn and force him to play a card or protect yourself from your opponent trying to control you. My boyfriend bought this game on promo at Essen Spiel 2015. It travelled with us to Berlin, London and Norway, keeping us entertained on the train and airplane. It’s very satisfying when you figured out the hand of your opponent and are able to block him completely off. For the small box, easy game mechanics and cheap price it has offered us a surprising amount of fun. This game can be best described as Qwirkle on anabolics. It’s an abstract tile laying game for 2-5 players that takes about 45 minutes. “Völuspa” is the oldest poem in Norse mythology about the creation of the world and its destruction. It tells the story of the endless struggle of powerful gods, dangerous creatures, and forgotten races. Players control several Norse gods in a fight for dominance. Set up is done by placing a random starting tile in the middle of the table and giving all players a hand of 5. The base game holds 60 tiles depicting 8 different Norse gods: Odin, Thor, Troll, Dragon, Fenrir, Skadi, Valkyrie and Loki. The game comes with a score pad and player tokens, but a piece of paper and a pencil will do just fine. In clockwise order all players add a tile, creating rows and columns. If the tile you placed has the highest value in a row and/or column, you’ll score VP’s equal to the number of tiles in that row and/or column. Ties don’t count. A row or column has to have at least 2 tiles and can hold maximum 7. After placing a tile players refill their hand. The game ends when all tiles are put on the table. What pushes this game beyond Qwirkle are the special god powers. For example no tiles can be placed adjacent to Trolls, a Dragon can be placed on top of another tile, the value of a Fenrir is the sum of all Fenrirs in that row/column,… Included in the box is the small expansion “Saga of Edda” which adds 4 extra gods to the mix. If you ever get bored the separate sold expansion “Order of the Gods” will add some more magic. It’s not a new game but I only discovered it recently and it’s really an interesting puzzle. The special powers create an ever-changing tableau that will keep your brain busy, also in between turns. The sturdy tiles tossed in the included bag will fit snuggly in your suite case or hand luggage. This fast paced dice version of Pandemic comes in a big box, but all components fit in the included dice bag. 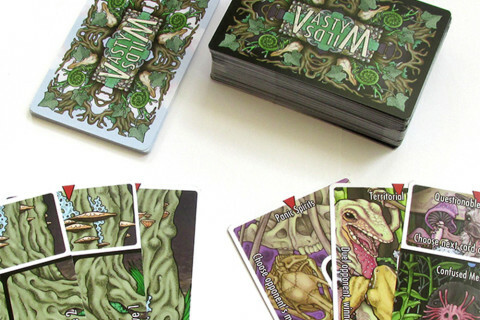 This cooperative game, for 1–5 players, offers a tense 30 minutes experience as you and your team of doctors try to find cures for 4 terrible plagues that threaten mankind. Set up is nothing more than selecting your character, shuffling the event deck – revealing 3, putting down the treatment center, surround it with the 6 region cards and rolling 12 infection dice. As much as in regular Pandemic, players can fly and sail to travel between regions, treat a disease and develop cures. A roll of your action dice determines the actions available on your turn. However, you are free to re-roll as many dice and as many times as you wish. Be careful though, rolling a biohazard symbol advances the infection rate and makes you lose the die for that turn. This press your luck element makes the game very thrilling. To make a cure players need to collect multiple samples (infection dice) of the same color and roll a result of 13 or more. The action dice holding the samples are blocked until the remedy is found, thus making the gameplay more and more tight. Each color of infection dice (= each disease) has varying dice faces. These determine how likely the disease will pop up in a certain region and how easy/hard the disease is to cure. By calculating the probabilities, players can make informed tactical decisions and the game doesn’t feel all that random. If too many outbreaks take place, too many people get infected (=empty dice bag), or the rate of infection gets too high, all the players lose. Winning the game is challenging, but the short gameplay makes several rematches possible! Three difficulty levels, intro – standard – heroic, make the game accessible for all player groups. And that’s it! 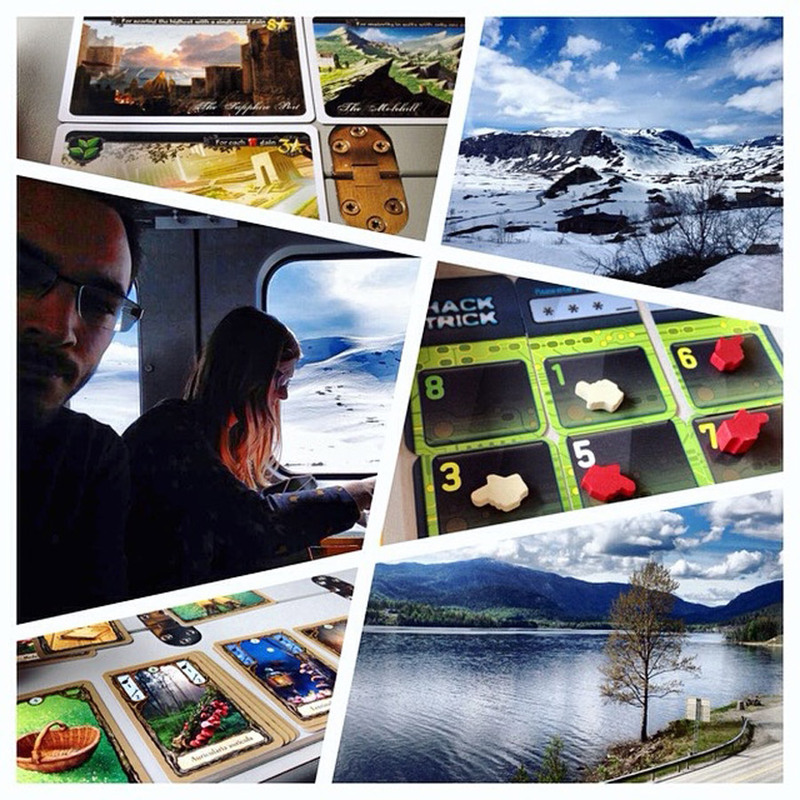 I hope my list of travel games got you inspired! Selecting just 5 was really difficult. I “forced” myself intentionally not to present only 2 player games, as summer holidays are all about exploring new countries, experiencing new cultures and meeting new people. Board games are the perfect ice breaker. Long lasting friendships can be created with only one play. Happy holidays everyone!